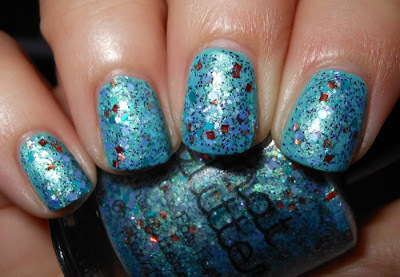 I have an awesome super glittery collection to share with you today! This is All That Glitters Princess Collection. I love a great glitter, and I love princesses. I'm a 5 year old at heart, and have no qualms about wearing princess crowns to Disney World and taking pictures with princesses. Needless to say, this is a collection I was very excited about! 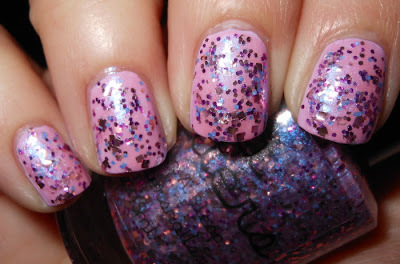 I am using All That Glitters' descriptions on these polishes, she can describe her own polishes better than me! You can get fuller coverage with these within around 3 coats, but I prefer to layer them over a base because it adds depth and uses less coats of polish. Glitteriest of Them All, Be Home by Midnight, Arose From a Sleep, Fins for Feet, Book Smart Beauty, Not a Prize to be Won, and Kissing on a Frog. Glitteriest of Them All has a deep red base with 7 multi-colored glitters scattered throughout in various sizes and colors to represent some little men Glittieriest Of Them All lived with. Be Home By Midnight has a light blue base and is mixed with chunks of a glass slipper; I mean silver holo, baby blue and perwinkle in various shapes and sizes. 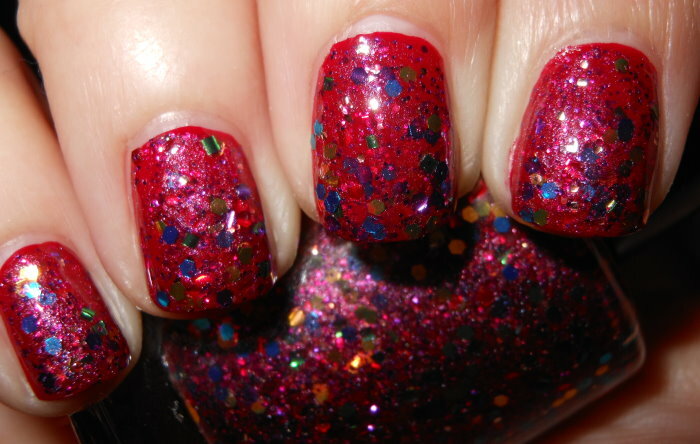 Arose From a Sleep has a pink/blue duo colored base with multiple pink, fuchsia and periwinkle glitters in various shapes and sizes. 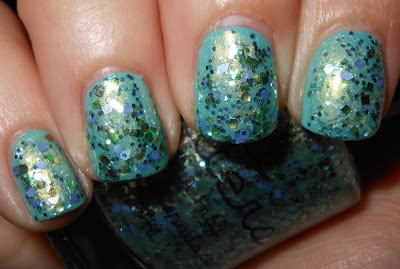 Fins for Feet has a blue/green duo colored base with tons of various blues/aquas/teals/periwinkle glitters as well as some green and purples. A little red glitter thrown in for good measure to match this Princess' hair. 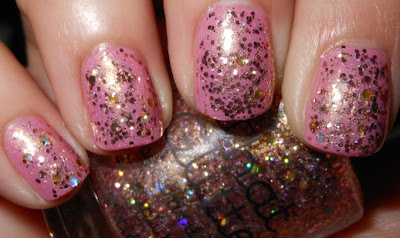 Book Smart Beauty has a pink/gold duo colored base with multiple pink and holo gold glitters in various shapes and sizes. Not a Prize to be Won over Nails Inc. Baker St.
Not a Prize to Be Won is a rebellious Princess polish and has a light turquoise colored base with different turquoises and purples glitters in different shapes, colors and sizes. Kissing on a Frog as a green/yellow duo colored base with sea green, periwinkle, turquoise, blues and greens mixed in various colors, shapes and sizes. These are beautiful glitters. I love how each of them matches perfectly to the princess in mind. That being said, they are creative and unpredictable. The combination of the colors, varying sizes of glitters, and the addition of duo colored bases really make these polishes special. I like the added touches in these because it shows how thoughtful Kirsten from All That Glitters was when creating these polishes. It is a very well conceived collection. The only thing I noticed was that some of the formulations were thicker than others, however I think this is to be expected with polishes that are this glittery. They were still very workable and applied well to the nail. I approve of this collection! All That Glitters next restock will be September 5th at 8pm PST on her etsy page. These polishes can be purchased individually or you can buy the whole collection. You can see more photos of this collection and get restock updates on All That Glitters Facebook page. OMG! I love this collection, the theme is so cute! I also love the Disney princess movies - just watched Aladdin the other day! Oh my god, I want all of these! I love all of the Disney princess movies, so these are amazing and perfect. It's so hard to choose a favorite because they're all beautiful, but my favorite Princess is Sleeping Beauty's Aurora, so I love Arose From a Sleep. They are so gorgeous all of them, but i think I like Glitteriest of Them All the best!! All of them are so fun! I love glitters! I love them all, I love Kissing on a Frog the most! I like Be Home by Midnight best, with the glass slipper chunks :P Perfect choice of base for that one btw. These swatches look great! You make me want the whole collection. I like Kissing a Frog!